BetaDwarf - Official Blog: Minion Master’s Monday - How to become a Minion? Minion Master’s Monday - How to become a Minion? We had another tournament weekend entertaining us with finest Minion Masters gameplay. King Puff Cup 11 took place last Saturday, the live stream by everyone’s favorite Dipshit joined by Tengs happened yesterday live on Twitch. Congratulations to our winners Memfisto (1st place), Some boxes (2nd place) and Dirion (3rd place)! Thanks to everyone participating and watching the stream, as well as to the King Puff Cup staff! You missed the show? Well, then here's your VOD! An extended Halloween event with two exclusive skins is enough, right? We didn’t think so and that’s why we present to you the Minion Masters Card Design Contest in cooperation with Zgriptor! Yes, you’ve heard us right – YOU can now become a Minion in Minion Masters and have the privilege of serving King Puff with fresh mana daily! C-SAR will love the show! Although, that’s not physically achievable, we’ll have settled the next best thing for you: you get to design and submit your card ideas for our brand new contest… and the best thing is, your card may actually get implemented into the game! • From Wednesday 8th on, you’ll have 2 weeks for you to think and carefully design your card. 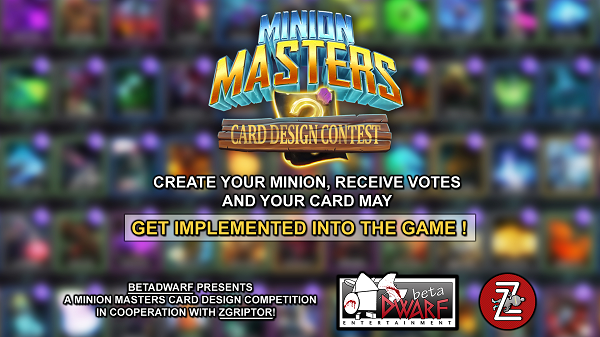 After that it goes into a big poll which takes 1 week and everyone is able to vote on your submitted cards – don’t try to cheat the system though, BetaDwarf has the final say on all cards! • Try to give as much information on your card as possible, we’re especially interested in the concept (how it’s going to look, rarity, mana cost, maybe some backstory), mechanics (special effects, abilities) and stats (Health, Targets, Movement Speed, Attack Speed, Damage, Range etc.) Remember: The more information you provide, the better the community and the developers can decide whether it’s worth to vote for your card or not! • Make sure your idea isn’t too complex though, and remember to ensure the card text fits and makes sense. Also, consider using an already existing Minion archetype if possible. If your card idea just needs a Warrior type Minion, is it then possible to use that Warrior as a basic concept? The less archetypes in the game, the easier it is for players to understand. But sometimes new archetypes are needed for sure. • Ensure your card has obvious counters, such as a Warrior not being able to hit air. 1. From Wednesday 8th on, you’ll have 2 weeks for you to think and carefully design your card. 2. After that, every card goes into one big poll that lasts for 1 week. 3. After all that, we begin the final voting period in which we pit against each other the best 3 cards from each category and this final voting process (5 days duration) will determine our grand winner that gets to join us in the great pan galactic warfare. Please note: BetaDwarf has the final say and provided card information is subject to change. Wait! Categories? Yes! The card categories allowed for this contest are Melee, Ranged and Flying! Except that, everything else is just limited by your own imagination! On Wednesday, we will create a thread on the Steam Suggestions subforum and Reddit for you to let us know your card designs. What out for additional information with the patch notes! We don’t want to go into too much detail right here, but on Wednesday 8th, there’s more than our newest Community event happening. We looked into balance for some time now and will present to you surprising changes. One of them involves Morgrul, who will see a change in mana costs. Others Raging Reinforcements, so you see the outcome of your next usage. There's also changes to Volco's Perk 1 and everyone's beloved Dragon Nest... so stay tuned for our Wednesday’s patch! Do you want the ESL Go4 Series before or after the official release? The votings ended about 2 weeks ago and we discussed the results internally. We expected 500 votes and almost reached that goal! Thanks for everyone participating! As you can see for yourself, there's no clear winner in the results. Players, who voted for the first option are only 8% (or 42 votes) ahead of players, who voted for the second option. 24% don't care, but would compete. Our decision is to wait with the ESL Go4 Series. We saw larger interest for the King Puff Cups and The Master's Challenge, but not enough to represent Minion Masters at the ESL with large numbers of participants, continuously. That and a fairly close voting brought us to this decision. What does that mean now? Is the ESL over for Minion Masters? Not at all! We maintain contact to the ESL Project Management and they assured us multiple times, that we can enter the ESL whenever we feel ready for it. As we mentioned in our news back at the end of September: we will just do another poll later on. That being said, we want to come to an end. You’re well informed for this week and we’re looking forward to your card ideas, your reactions to the balance changes and another week with an amazing community!